Randolph Alvin Goodson was born the fourth child of seven children to the late Ulean Bertha Williams Goodson and Isaiah Herman Goodson, Sr. on November 12, 1955. He departed to be with his loving mother and the Lord on April 3, 2019. “Randy”, as he was so lovely called, was educated at both Lockhart and Garner School System. Randy accepted Christ at an early age and remained active in the church, through the encouragement of his parents. Randy was always a busy and happy child and spent many hours with his siblings playing and making them laugh. Randy loved his family and truly mourned the loss of his mother. Randy’s parents taught him the value of hard work. One of the first stepping stones leading to his future passion was when his father assisted him in getting a job with Dillon Supply Company, where he developed the skill of a welder. He later worked at the airport with his brother Stanley for Eastern Airlines. Randy welcomed into the world his only son, Darron A. Jones in 1981, which he loved very much. Randy enjoyed spending time with Darron, putting together model cars, traveling to the beach and going to car events. Growing up Randy’s past time was putting model cars together. Randy spent many hours restoring a 1955 Chevrolet, which he painted red with white leather interior, and could be seen parked in his mother’s yard. Randy worked at several body shops before opening his own body shop, “Precision Auto Body Shop”, where he spent time perfecting his craft. He was well known in the Raleigh, Clayton and surrounding areas for having an expert knowledge in body work and mechanics. His expertise was developed with procession. His love of cars was always there and as he horned his craft moved onto work at Harrell Estes Body Shop, and American Airlines. He worked for the City of Raleigh until his retirement. In 1993, Randy met Lettie Martin at Bike Fest in Myrtle Beach South Carolina and shortly thereafter they began to date. In September 2003, Randy and Lettie were joined in matrimony. He was well versed in the word of God. God’s calling on his life was evident over the years as he taught Sunday school at various churches. Randy’s leadership role started well before returning back to church from where he started. Randolph was called to serve as a deacon at the New Life Church in 2004. God saw the need for Randolph to continue in a leadership role as he was ordained on January 6, 2019 as a deacon of Good Hope Missionary Baptist Church. Taking after his mother, Randy loved to cook and bake food for his friends and family and would prepare big meals for holidays and special events. He was known for cooking a pig and all the sides items inviting people to come by just to laugh and fellowship. He was an expert artist and spent a lot of time drawing and painting. He loved pier fishing, deep sea fishing, the beach, and race car events. He was a natural born comedian and would make anyone who came into contact with him laugh. His smile was infectious, and he was truly a happy person. He was so excited and looking forward to the coming birth of his twin grandson’s Micah and Judah around April 29, 2019. 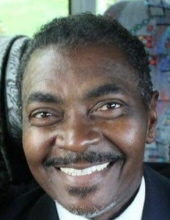 Randy leaves behind his loving wife, Lettie Goodson of the home; his only son, Darron A. Jones (Crystal) of Raleigh; stepdaughter, Brittanney N. Williams of Whiteville; father, Isaiah H. Goodson, Sr. of Clayton; sister, Debra J. Sanders of Garner; brother, Isaiah H. Goodson, Jr. (Mary) of Raleigh; sister, Gracie D. Goodson of Raleigh; brother, Stanley L. Goodson of Jonesboro, GA; brother, Terrence L. Goodson of Clayton; sister, Tiffany C. Goodson of Raleigh, and a host of nieces, nephews, aunts, uncles, cousins and special friends. To send flowers or a remembrance gift to the family of Randolph A. Goodson, please visit our Tribute Store. "Email Address" would like to share the life celebration of Randolph A. Goodson. Click on the "link" to go to share a favorite memory or leave a condolence message for the family.